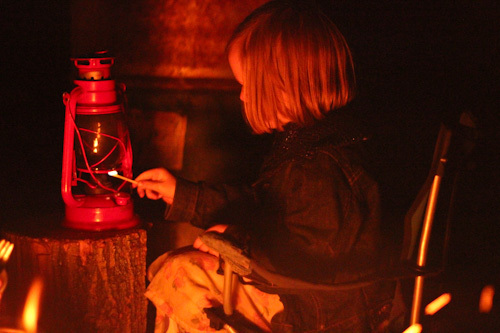 Six-year-old Aisha and five-year-old Brioni may have spent some time at this last campsite learning how to light the kerosene lantern, but the real lesson was for David and me. We’ve been learning to let go of fears that prompt us to interfere with our children’s natural inclinations to learn. The setting is a bush camp. It’s evening, and the campfire is roaring. Dinner has been served, but we’d like some extra lights and the 12-volt system in our travelling rig is not working. We’ve previously admitted that we let our children play with fire, and so letting them experiment in lighting the kerosene lantern is familiar Fisher style. Carefully coordinating the match, position of the glass and the height of the wick, 6yo Aisha practices lighting our kerosene lantern. While staying in Oberon, we had bought extra-long matches to help the girls light their fires more successfully. Conventional matches had proved hard for them to keep alight long enough to make a fire start. So we were prepared for this lesson. We provided detailed instructions on our own methods for lighting the lantern and then handed it over. Aisha and Brioni negotiated their own turn-taking system, and we sat back to watch their progress. Eagerly, a girl would open up the sliding drawer, remove a match, strike it against the side of the box and make an attempt to light the wick. Sometimes they were successful — coordinating their movements successfully to light the lantern — but then they would blow out the lantern and start again. As David and I watched the girls light match after match — often losing the flame to the wind, other times struggling with the lantern’s glass or wick and blowing out the match as the flame crept close to their little fingers — we felt anxiety. This was a waste of good matches! Aisha and Brioni ignored our leading questions. They were intent on figuring out the best way to light the lamp, and in this case — practice makes perfect. When David and I discussed our attitudes objectively, we could see that our motivation to conserve the matches was foolish. We somehow felt that the remaining matches were of greater value than the practice that the girls were having in learning how to light the lantern. Truthfully, the $2.79 that I paid for the box of premium, extra-long matches was a bargain for the lesson that our children gave themselves! But in the irrational heat of the moment, all I could feel was attachment for those special matches that I bought and negative emotion at watching them being wasted! Letting go of the idea that money is more important than our relationship with our children is a necessary lesson for us. When even a trifling amount can trigger a reaction within us, we’re demonstrating that we would rather save $2.79 and quell our children’s inclination towards experimentation. Thankfully, David and I stopped ourselves in time from stifling our children’s spontaneous lesson. At some point, Aisha and Brioni had enough, and the lamp remained lit. Later — after they had gone to bed — I fingered the matches that were left in the box. 17. That’s more than enough for tomorrow’s fire. Unless the girls want to play with the lantern again, and then it’s an educational bargain. This we have learned. And we shall not forget. What a great lesson for the girls and for you. They gained confidence by practising the skill and were able to figure out the safest and best way to do it. You overcame the thought of matches being wasted by seeing it from their point of view….an inexpensive lesson tool/aid. I loved this post. Matches are valuable but learning is even moreso. I recall being distressed when my first child as an early walker wanted to put toilet paper in the loo and flush to see the roll unwind and disappear and each time the paper broke he was so intent on doing it over again. The value in learning to light a lantern is obvious but I wasn’t seeing any value in this waste of water and toilet paper – both things we try to conserve. But the drive to experiment with the paper was strong – so much so that the more I tried to stop him the more he tried to do it when I wasn’t looking. In the end I realised that whatever he was getting out of the activity was lost to me but was important to him and I also realised that I’d think nothing of spending a few dollars on other activities that I considered served no purpose other than to occupy him. So, I bought him a whole packet of cheap loo paper, told him it was his to do with as he pleased and let him go for it. At some point before the packet was finished the experiment ran it’s course. When his younger siblings reached the same age they also had a strong desire to do the same thing but this time I was able to simply buy more that week so we had enough for the experimentation and to use the regular way.